With a quarter of the NFL's regular season in our rear view, the time to overreact is now. The sky is either shining bright or falling down upon us. With twelve games to go, and fantasy football playoffs just over two months away, there are many twists and turns yet to unfold. As we enter week 5, the amount of teams on bye weeks expand. Injuries continue to mount. That guy that was supposed to carry your team has yet to deliver the goods. Coaches get fired. In other words, who knows what will happen over the next several weeks. The only thing that is predictable is the unpredictable. Whether you're 4-0, 0-4, riddled by injuries, or amused by your opponent's failed attempt at streaming defenses, we've all been on some sort of emotional roller coaster at this early juncture, and the ride is just beginning. As a wise man who wore way too much makeup once said: "My life has been a roller coaster ride, but somehow I've always been able to land on my feet and still play the guitar." We're not sure what that has to do with fantasy football, but we do know that the game's top wide receivers continue to show why they are so important to their teams, and to yours as well. Week 5 appears to be packed full of intriguing matchups, unfortunate injuries, sneaky sleepers, and even more peaks and valleys as the ride rolls on. An asterisk (*) next to a player's name denotes a possible injury concern for that player. 1. Julio Jones vs WAS- Julio is having a dream year. The only thing that could slow him down last week was the Falcons jumping out to a heavy advantage which scaled back his role. The Redskins and their underrated defense should present a much bigger challenge for Atlanta in week 5, and they'll need Jones to dominate. Potentially a tricky matchup, but you can sleep easily at night knowing that you have Julio on your team. 2. Odell Beckham Jr. vs SF- Young ODB was slowed by a good Bills' defense in week 4, but saw a team-high 12 targets and figures to get back on track against a 49ers team that is trending way down. His chemistry with Eli Manning should be much better at home in this one. 3. Julian Edelman @ DAL- We love Edelman most weeks, but especially in week 5. The Cowboys have some injuries to contend with, and saw the likes of Willie Snead, Mark Ingram, and C.J. Spiller make plays in the short passing game in week 4. That is an area where Edelman and Tom Brady thrive most. 4. Calvin Johnson vs ARI- Megatron and his teammates will be looking to put the controversial ending in Monday night's loss at Seattle behind them. He'll get the Cardinals at Ford Field this week, and will be locked in on another double-digit target game, having caught 7 of 11 in week 4. 5. Demaryius Thomas @ OAK- His health is not a concern, and Thomas' prospects are bright ahead of a matchup with the Raiders. He's only scored one touchdown, but has averaged 12.5 targets per game and should see plenty more in Oakland. 6. Antonio Brown @ SD- Week 4 did not go so well for Brown as he adjusted to life without Big Ben Roethlisberger. Mike Vick was doing some adjusting of his own as he made his first start as a Steeler, and the chemistry should be better between the two in week 5. In addition, Martavis Bryant returns from his suspension, which should help clear things up for Brown in the spatial areas he thrives in. 7. Randall Cobb vs STL- It's easy for defenses to key on Cobb without Jordy Nelson and Davante Adams, but it's much harder to stop him from producing. Cobb and the Pack get the inconsistent Rams at home. He's on pace for a 100-catch season, making him an even tastier top play in PPR leagues. 8. Emmanuel Sanders @ OAK- Much like his teammate Demaryius Thomas, Sanders is a weekly shoe-in to lineups in all formats. He's a big play waiting to happen all over the field, and should have plenty of opportunities against the Raiders. 9. T.Y. Hilton @ HOU- Andrew Luck's impending return is great news for Hilton and Donte Moncrief. They get the Thursday night matchup in Houston in week 5, where Hilton will look to find the end zone for the first time this season. His lack of scores and early-season injury are the only things that have held Hilton back from the 2015 breakout game which is surely imminent. 10. Larry Fitzgerald @ DET- What a pleasure it will be to watch two of the best ever in Fitzy and Megatron as they share the field in Detroit. Fitzy is playing like it's 2005, and is on pace for a monster 120-catch season. Carson Palmer has played his part in that success, and they'll look to carry that synergy into Ford Field in week 5. 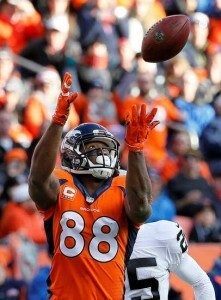 Count on Demaryius Thomas to deliver against the Raiders in week 5. 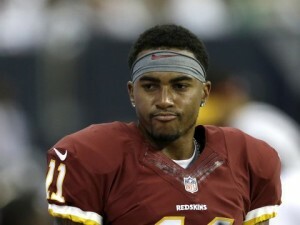 DeSean Jackson: will DJax make his return in week 5? Marlon Brown vs CLE- Likely to fill in while Steve Smith Sr. (back/ribs) sits out. Jacoby Jones vs PIT- Could see a big role if one or both of Stevie Johnson (hamstring) and Malcom Floyd (concussion) can not play. Additionally, Jones knows the Steelers' personnel quite well from his time in Baltimore. Willie Snead @ PHI- Snead is becoming the new Lance Moore in the Saints' offense. Drew Brees continues to look his way. Leonard Hankerson vs WAS- A revenge game for Hankerson who has shined in his new role on his new team. Remember to keep an eye on the injury report and any subsequent changes on the depth chart. Good luck in week 5.